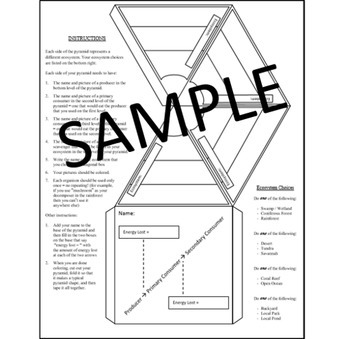 In this assignment students will choose four ecosystems from the list provided and create a food chain for each ecosystem on each of the four sides of the food chain pyramid hand out. Each side of the pyramid will have a producer native to the ecosystem selected, a primary consumer that would eat that producer, a secondary consumer that would eat the primary consumer, and a decomposer / scavenger that would break down / eat them all after they had died. 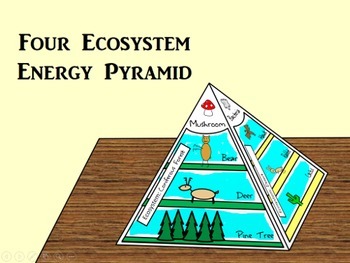 This assignment is a simple and engaging way to review (or introduce) the flow of energy through ecosystems. There’s not necessarily higher level critical thinking at work here, but every once in a while it’s nice to have a therapeutic color, cut and tape type of activity for a change – one which still touches on core concepts.